The occupants of the cars received minor injuries. Emergency services were called to a two-car smash on the southbound carriageway of the M6. The accident happened between junctions 32 and 33 near Garstang at around midnight on 14 March. The occupants of the cars received minor injuries, say police. Traffic was stopped for a short time while debris was cleared from the road. 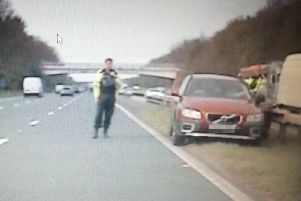 A tweet by Lancashire Road Police said: "M6 southbound near Garstang. 2 vehicle RTC, fortunately only minor injuries."